Metal hanging file folder holders allow you to convert any drawer metal or wood to accept hanging files. Can be custom cut to your filing needs. Our custom cut file bars and file bar stock are designed to be cut to length per application. Filebars.com can pre-cut them for you to your specifications (however we do not cut notches). Manufactured in Steel to your specs. Available in any size 12" to 40". Delivery Time Approx. 21 bus. days. Universal Metal File Holder Bars works in metal or wood cabinets. 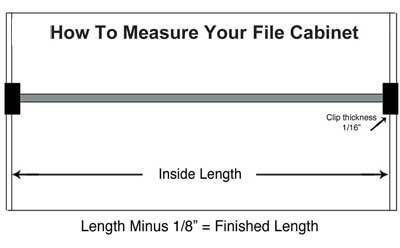 File Bars can be custom cut to any size up to 40" to fit any file drawer. (How to measure). Available 1/2" high & 3/4" high, heavy duty extruded aluminum 1/8" thick. Metal file hanger bars can you be used in either wood or metal drawers for front to back or side to side filing. Size : 7/16" 1/2" 3/4"
Need Clips? 2 Clips are usually needed per bar. Scroll over images to see installed. Designed to fit over a 1/2" standard wood drawer side. Use with our 1/2" or 3/4" file bar stock for any combination legal/letter drawer filing configurations. Steel Hanging File Rod available in 3/16" dia. or 1/4" dia. (for heavier loads)for front to back or side to side filing in wood drawers. Use with our 5080 Bracket Clips.